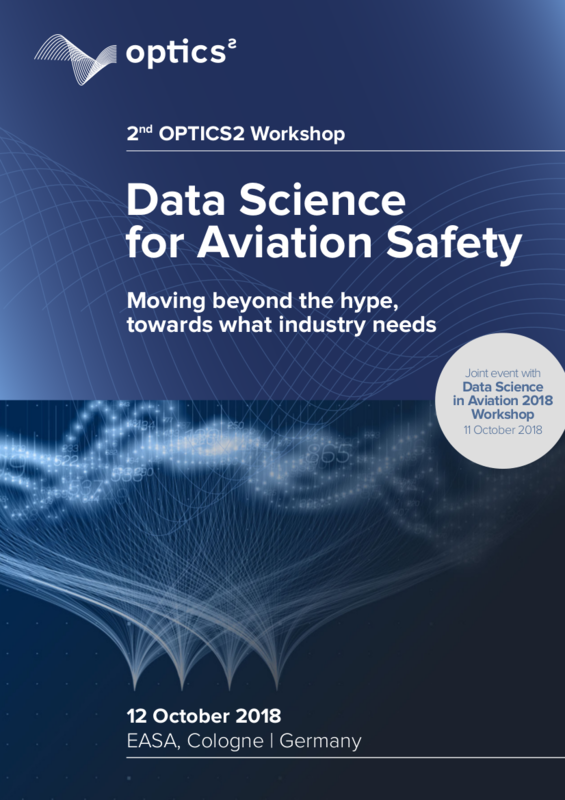 The OPTICS2 2nd Workshop on Data Science for Aviation Safety took place on the 12th of October 2018 at EASA (Cologne), following the Data Science in Aviation Workshop (11th of October, EASA Cologne). The OPTICS2 Workshop offered exclusive speeches and group activities aimed at identifying the most promising Data Science research avenues for triggering effective collaboration between industry and research. 9:20 The Industry’s viewpoint: what are the upcoming changes to aviation markets, and how will these challenge safety? Two top experts from each industrial segment. 10:15 The Passenger’s viewpoint: what do they expect from Data Science for Safety? 10:40 Workshop sessions (groups): How can data science help address these safety challenges? Scientific Advisors: Andrew Cook (Westminster University), Paula Lopez (Innaxis), Samuel Cristóbal (Innaxis). 12:15 Expert panel session (plenary): What are the 3 research avenues with the highest potential for triggering effective collaboration between research and industry? Nowadays the aviation industry is well-known for its hard-earned, well-defended safety system. However, increasing traffic together with a constantly evolving model of operation exposes the system to new threats and risks. The transition from an incident-driven safety learning approach towards a data-driven one seems to be the most promising way forward. But how do we make the data available, and ensure the insights reach those who can best act on them? And how do we increase safety intelligence, data sharing and learning between different aviation segments? A range of top experts and leading-edge researchers from all aviation segments, will be brought together to share best practices, discuss how to overcome existing gaps, and identify the 3 research avenues with the highest potential for triggering effective collaboration between research and industry. Stay tuned, and download the printable version of the Agenda.